The history of this site of pilgrimage is complicated. 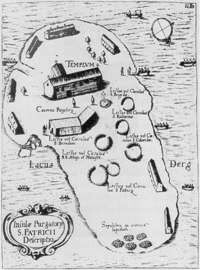 There was an old Irish monastery on the present Station Island. From about 1130 on, the Canons Regular of St Augustine took charge, but moved the pilgrimage to Saints Island (right), where they remained right down to the Reformation. The Canons then ran into problems of staffing the sanctuary. In 1631 the Archbishop of Armagh officially requested that the Franciscans be given charge of the shrine. There is some evidence to indicate that friars were working at Lough Derg before this. The Franciscans continued in charge all during the Cromwellian period and well into the following century. 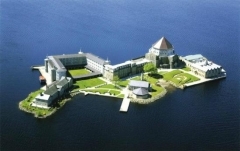 At some time, they changed from Saints Island back to Station Island (right) . About 1763 they built a small friary and oratory dedicated to Our Lady of the Angles – the title of the famous Franciscan church in Assisi. In 1780 work began on a church dedicated to St. Patrick, but the very next year falling vocations forced the friars to hand over the shrine to the clergy of the diocese of Clogher.